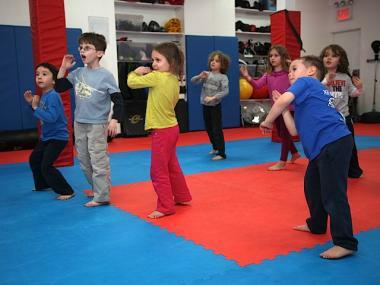 UPPER WEST SIDE — A row of children between the ages of 4 and 8 lined up on blue gym mats at the International Krav Maga studio while their teacher quizzed them on defending themselves against impending danger. "In Krav Maga, there are no rules. Name one thing to keep yourself safe," said John Gonzalez, 40, a teacher at the studio's after-school program. Six-year-old Lily Armet raised her hand in the air, and answered calmly, "If you have a backpack, you can use it to block." Discussion of attacks and attackers is normal at the studio, which teaches Krav Maga, the official self-defense system of the Israeli Defense Force. The system, known for its strong, brutal counter attacks, combines boxing, jiu-jitsu, wrestling and grappling techniques with a focus on real-world situations. It was derived from street-fighting methods developed by Hungarian fighter Imi Lichtenfeld during the late 1930s in Bratislava, Slovakia. Children enrolled at the IKM studio learn basic Krav Maga defense tactics, standing in "fight stance." While it's often used to train law enforcement agencies, the International Krav Maga studio tailored the moves to an age-appropriate level for students at the 100th Street studio's after-school program. "There's a huge difference with age and coordination," said studio owner Tsahi Shemesh, 30, who began learning Krav Maga as a child in Israel. "We don't teach children the same thing we teach adults or the military." Shemesh said there were few other options in the small town of Tal Shachar, Israel, where he grew up and all the children practiced Krav Maga. "When I was young, that is what was taught and it wasn't an option not to do it," he said. "They [children] don't have the same skills as adults. They mainly learn through games, and they're also much smaller than most of their attackers." Most of the Krav Maga techniques for children are taught through games like "Every Man for Himself Dodgeball" and role-playing activities to develop motor skills and self-awareness. The four-padded pillars inside the studio are used for a game that mixes tag with "working the bag," which tests awareness of surroundings to avoid being tagged. "If you get hit, you'll go to one of the punching bags and hit 1-2-3-4-5," Gonzalez said, who has led the after-school class since the studio launched the program in April 2012. "You have to be ready to block." The girls and boys in the class stand in a "fight stance" while Gonzalez walks around and tests their ability to block with a small spar, teaching stance, blocks and evasion techniques. Dawn Nadeau, a petite mother of two girls aged 5 and 7, enrolled her daughters in the program after developing an interest in the self-defense system. "I've always been into self-defense," said Nadeau, who said she was mugged at knifepoint in Boston after she finished college. "I'm probably more sensitive because I have girls." Nadeau, who is in training to become certified as a Krav Maga instructor, said the popular Israeli method provides an essential skill for her girls. The Upper West side mother enrolled her youngest daughter, Abigail, in the after-school program when she was just 4 years old. "To me, it's like swimming — it's a life skill," Nadeau said. "It teaches them to honor their inner voice. Avoiding the situation is the first form of defense." Many of the kids at the International Krav Maga studio are also signed up for other after-school activities, like ballet or hip-hop. "I like it as much as ballet," said one student, Lily, showing a bright smile after the one-hour class. Lily's mother, Elizabeth Armet, 41, said she enrolled her daughter in the program to boost her child's self-confidence. "She's much stronger and more confident now," Armet said. Shesesh said many parents of children in the program don't distinguish Krav Maga from any other form of martial-arts like karate or jiu-jitsu. But he said there's still a significant difference. "It's not martial-arts — it's self-defense," he said. "Some parents choose to do Krav Maga because it's Jewish and they want to do something from Israel," he added. "But, once they're here, they understand it."